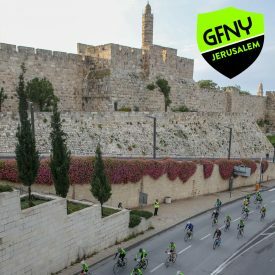 (NEW YORK CITY, May 3, 2018) – The historic city of Jerusalem hosted the inaugural GFNY Middle East – Africa Championship last Friday, April 27. It was hailed by the Minister for Jerusalem Affairs and Heritage, MK Zeev Elkin Sai, as a big step forward in transforming the city into an international cycling destination. Mayor of Jerusalem, Nir Barkat started the race and gave a warm opening ceremony welcoming the 1300 riders from 30 countries. The riders went out fast from the start along the rolling hills course through the heart of the city. Along the course, riders were treated to an amazing tour of Jerusalem passing most historic sights such as the Tower of David, The Knesset, Mammila, The Old City of Jerusalem and then onto and up the Jerusalem Hills on fully-closed-to-traffic roads. A group of seven quickly formed, but after 4km, Jurgen Moreels of Belgium turned up the heat and created a gap of 5 minutes. After 40km, the chase group began to break down. They had been working hard to catch Moreels, but their effort was no match for the power of the Belgian on a day where he averaged 38kph through Jerusalem City, and over 80kph on the downhill section. Moreels never looked back and crossed the line in 03:51:04 for the inaugural GFNY Middle East-Africa Championship held at the inaugural GFNY Jerusalem. Aaron Hitman from Israel was in second with a time of 04:00:56. Alon Lehrer rounded out the podium in 04:01:45. In the women’s race, the top two were the only women to finish in less than 5 hours. Local, Paz Bash took a dominating win in 4:44:49, followed by Noa Borochovitch (Isr) 4:50:48 and Keren Meretz (Isr) in 5:04:52. 20% of finishers in each age group in the long route will qualify for the Racer Corral at the 2018 Campagnolo GFNY World Championship in NYC on May 20th.